Using aggregations in Power BI enables interactive analysis over big data in ways that previously weren't possible. Aggregations can dramatically reduce the cost of unlocking large datasets for decision making. Query performance over big data - as users interact with visuals on Power BI reports, DAX queries are submitted to the dataset. Boost query speeds by caching data at the aggregated level, using a fraction of the resources required at the detail level. Unlock big data in a way that would otherwise be impossible. Data refresh optimization - reduce cache sizes and refresh times by caching data at the aggregated level. Speed up the time to make data available for users. Achieve balanced architectures - allow the Power BI in-memory cache to handle aggregated queries, which it does effectively. Limit queries sent to the data source in DirectQuery mode, helping stay within concurrency limits. Queries that do get through tend to be filtered, transactional-level queries, which data warehouses and big-data systems normally handle well. Table-level storage is normally used with the aggregations feature. 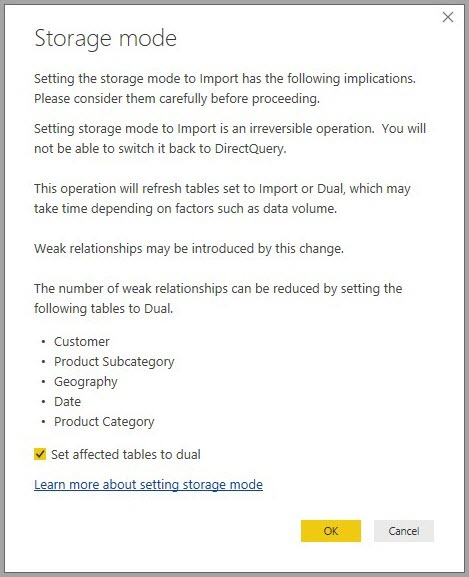 See the storage mode in Power BI Desktop article for more information. Aggregations are used with data sources representing dimensional models, such as a data warehouses, data marts, and Hadoop-based big-data sources. 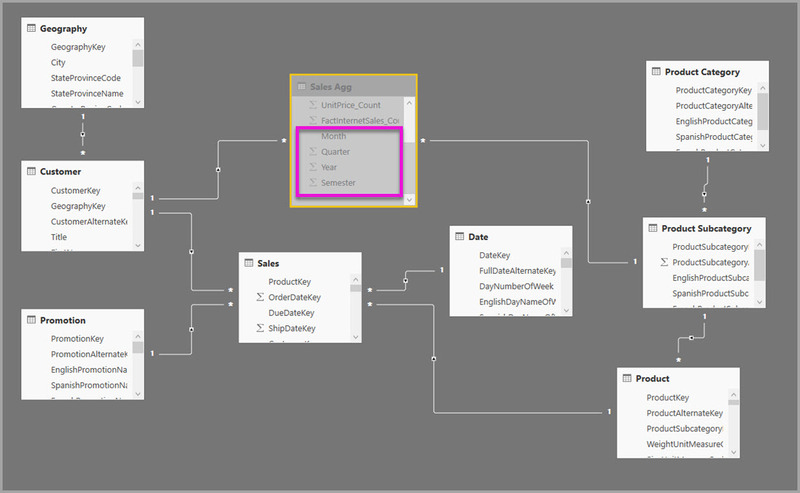 This article describes typical modeling differences in Power BI for each type of data source. 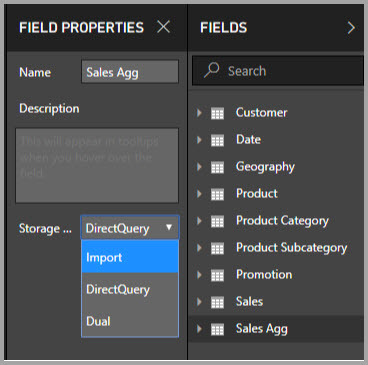 All Power BI Import and (non-multidimensional) DirectQuery sources work with aggregations. 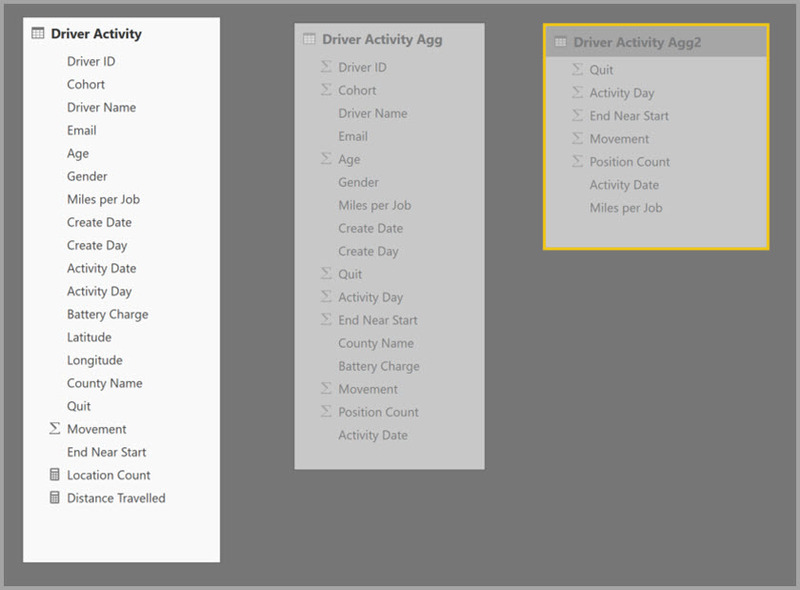 The aggregations feature is in Preview, and must be enabled in Power BI Desktop. To enable aggregations, select File > Options and Settings > Options > Preview Features, then select the composite models and the Manage aggregations checkboxes. You'll need to restart Power BI Desktop for the feature to be enabled. Aggregations based on relationships are typically used with dimensional models. Power BI datasets that source from data warehouses and data marts resemble star/snowflake schemas with relationships between dimension tables and fact tables. Consider the following model, which is from a single data source. Let’s say all the tables are using DirectQuery to start with. The Sales fact table contains billions of rows. Setting the storage mode of Sales to Import for caching would consume considerable memory and management overhead. Instead, we create the Sales Agg table as an aggregation table. It's at a higher granularity than Sales, so it'll contain far fewer rows. The number of rows should equal the sum of SalesAmount grouped by CustomerKey, DateKey, and ProductSubcategoryKey. Instead of billions, it might be millions of rows, which are much easier to manage. Let's assume that the following dimension tables are the most commonly used for the queries with high business value. They're the tables that can filter Sales Agg using one-to-many (or many-to-one) relationships. The following image shows this model. The Sales Agg table is just another table, so it has the flexibility of being loaded in a variety of ways. For example, aggregation can be performed in the source database using ETL/ELT processes, or by the M expression for the table. 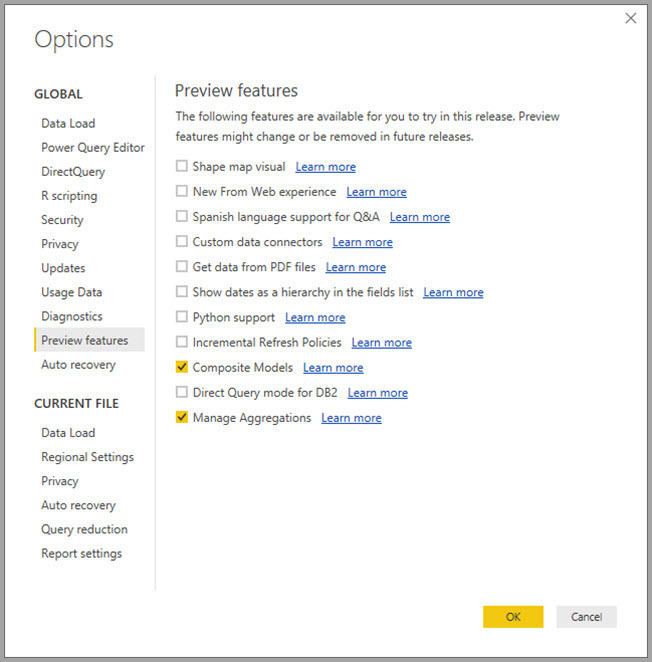 It can use Import storage mode with or without incremental refresh in Power BI Premium, or it can be DirectQuery and optimized for fast queries using columnstore indexes. This flexibility enables balanced architectures that spread query load to avoid bottlenecks. Let's continue with the example we're using. We set the storage mode of Sales Agg to Import to speed up queries. When we do so, the following dialog appears, letting us know that the related dimension tables can be set to storage mode Dual. Setting them to Dual allows the related dimension tables to act as either Import or DirectQuery depending on the subquery. Queries that aggregate metrics from the Sales Agg table, which is Import, and group by attribute(s) from the related Dual tables can be returned from the in-memory cache. Queries that aggregate metrics in the Sales table, which is DirectQuery, and group by attribute(s) from the related Dual tables can be returned in DirectQuery mode. The query logic including the group by operation will be passed down to the source database. For more information on the Dual storage mode, see the storage mode article. Aggregations hits based on relationships require strong relationships. Strong relationships include the following combinations where both tables are from a single source. The only case where a cross-source relationship is considered strong is if both tables are Import. Many-to-many relationships are always considered weak. 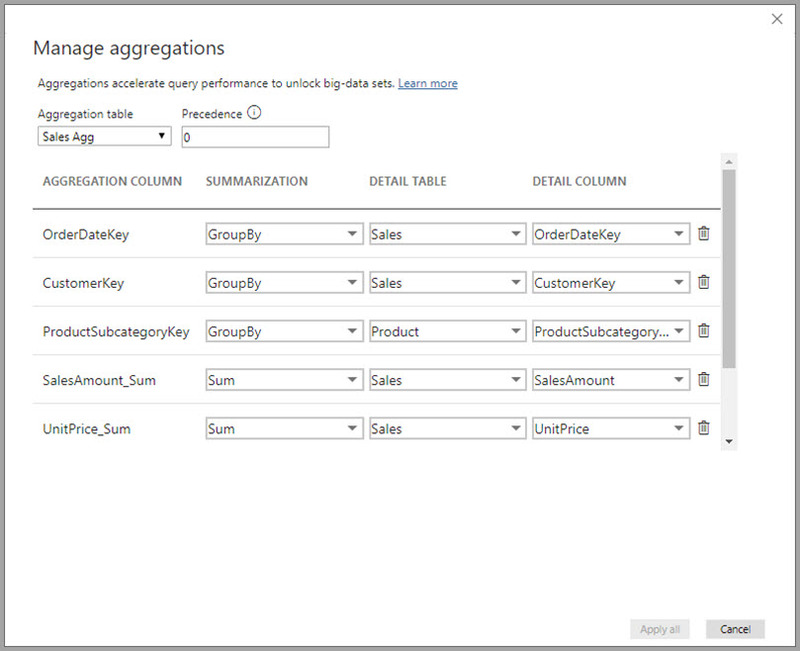 For cross-source aggregation hits that don't depend on relationships, see section below on aggregations based on group-by columns. The Sales Agg table is hidden. Aggregation tables should always be hidden from consumers of the dataset. Consumers and queries refer to the detail table, not the aggregation table; they don't even need to know the aggregation table exists. Next we define the aggregations. Select the Manage aggregations context menu for the Sales Agg table, by right-clicking on the table. The Manage aggregations dialog is displayed. It shows a row for each column in the Sales Agg table, where we can specify the aggregation behavior. Queries submitted to the Power BI dataset that refers to the Sales table are internally redirected to the Sales Agg table. Consumers of the dataset don't need to know the Sales Agg table even exists. The following table shows the aggregations for the Sales Agg table. The Summarization drop-down offers the following values for selection. The detail column selected must have the same datatype as the aggregation column except for the Count and Count table rows summarization functions. Count and Count table rows are only offered for integer aggregation columns, and don't require a matching datatype. Chained aggregations covering three or more tables aren't allowed. For example, it is not possible to set up aggregations on Table A referring to Table B that has aggregations referring to Table C.
Duplicate aggregations where two entries use the same summarization function and refer to the same detail table/column aren't allowed. During this public preview for aggregations, the following validations are also enforced. We intend to remove these validations upon releasing for general availability. Aggregations cannot be used with row-level security (RLS). Public preview limitation. Detail table must be DirectQuery, not Import. Public preview limitation. Most such validations are enforced by disabling dropdown values and showing explanatory text in the tooltip, as shown in the following image. In this example, the three GroupBy entries are optional; they do not affect aggregation behavior (except for the DISTINCTCOUNT example query, shown in the upcoming image). They are included primarily for readability purposes. Without these GroupBy entries, the aggregations would still get hit based on the relationships. This is different behavior from using aggregations without relationships, which is covered by the big data example that follows later in this article. For more information about how to detect whether queries are returned from the in-memory cache (storage engine), or DirectQuery (pushed to the data source) using SQL Profiler, see the storage mode article. That process can also be used to detect whether aggregations are being hit, too. Additionally, the following extended event is provided in SQL Profiler. The following JSON snippet shows an example of the output of the event when an aggregation is used. matchingResult shows that an aggregation was used for the subquery. dataRequest shows the group-by column(s) and aggregated column(s) used by the subquery. mapping shows the columns in the aggregation table that were mapped to. The following query hits the aggregation, because columns in the Date table are at the granularity that can hit the aggregation. The Sum aggregation for SalesAmount will be used. The following query doesn't hit the aggregation. Despite requesting the sum of SalesAmount, it's performing a group by operation on a column in the Product table, which is not at the granularity that can hit the aggregation. If you observe the relationships in the model, a product subcategory can have multiple Product rows; the query wouldn't be able to determine which product to aggregate to. In this case, the query reverts to DirectQuery and submits a SQL query to the data source. The COUNTROWS function can benefit from aggregations. 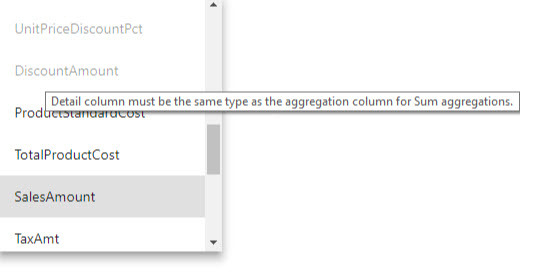 The following query hits the aggregation because there is a Count table rows aggregation defined for the Sales table. The AVERAGE function can benefit from aggregations. The following query hits the aggregation because AVERAGE internally gets folded to a SUM divided by a COUNT. Since the UnitPrice column has aggregations defined for both SUM and COUNT, the aggregation is hit. In some cases, the DISTINCTCOUNT function can benefit from aggregations. The following query hits the aggregation because there is a GroupBy entry for CustomerKey, which maintains the distinctness of CustomerKey in the aggregation table. This technique is still subject to the performance threshold where over approximately two to five million distinct values can affect query performance. However, it can be useful in scenarios where there are billions of rows in the detail table and two to five million distinct values in the column. In this case, the distinct count can perform faster than scanning the table with billions of rows, even if it were cached into memory. Hadoop-based big data models have different characteristics than dimensional models. To avoid joins between large tables, they often don't rely on relationships. Instead, dimension attributes are often denormalized to fact tables. Such big data models can be unlocked for interactive analysis using aggregations based on group-by columns. The following table contains the Movement numeric column to be aggregated. All other columns are attributes to group by. It contains IoT data and a massive number of rows. The storage mode is DirectQuery. Queries on the data source that aggregate across the whole dataset are slow because of the sheer volume. To enable interactive analysis on this dataset, we add an aggregation table that groups by most of the attributes but excludes the high cardinality attributes like longitude and latitude. This dramatically reduces the number of rows, and is small enough to comfortably fit into an in-memory cache. The storage mode of Driver Activity Agg is Import. 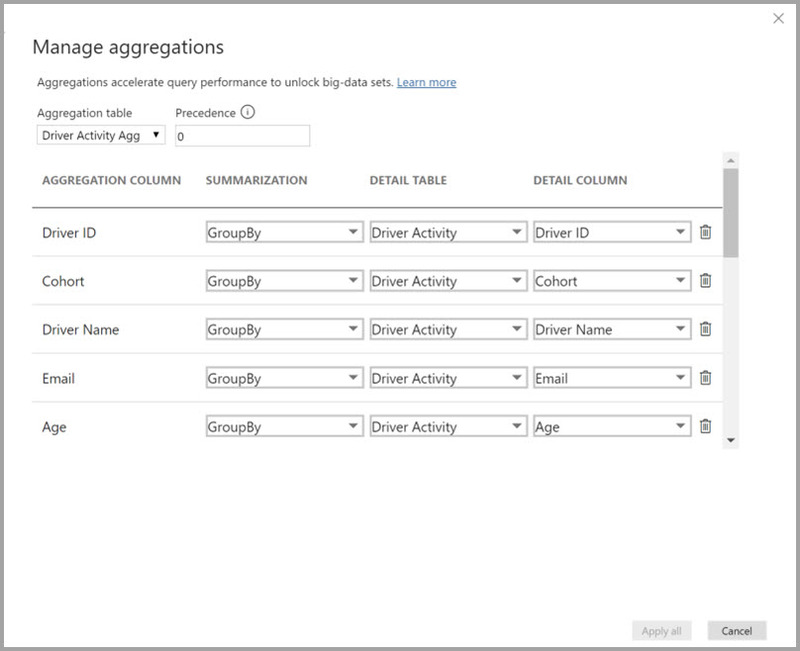 Next, we define the aggregation mappings in the Manage aggregations dialog. It displays a row for each column in the Driver Activity Agg table, where we can specify the aggregation behavior. The following table shows the aggregations for the Driver Activity Agg table. In this example, the GroupBy entries are not optional; without them the aggregations wouldn't get hit. This is different behavior to using aggregations based on relationships, which is covered by the dimensional model example provided previously in this article. 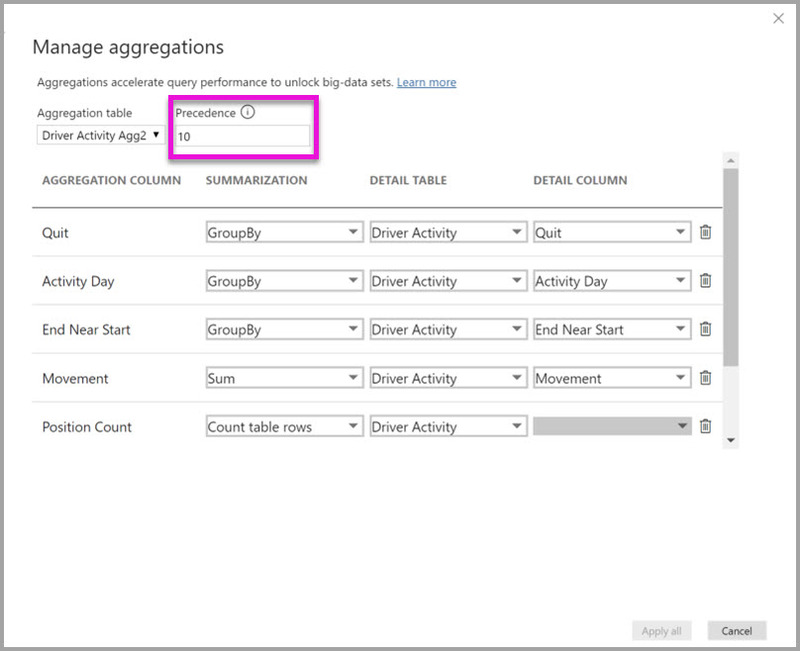 The following query hits the aggregation because the Activity Date column is covered by the aggregation table. The Count table rows aggregation is used by the COUNTROWS function. Especially for models that contain filter attributes in fact tables, it's a good idea to use Count table rows aggregations. Power BI may submit queries to the dataset using COUNTROWS in cases where it is not explicitly requested by the user. 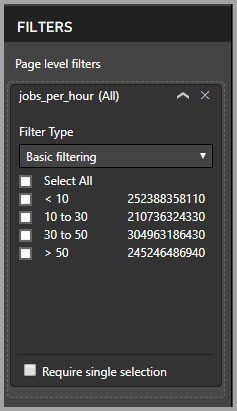 For example, the filter dialog shows the count of rows for each value. Aggregation precedence allows multiple aggregation tables to be considered by a single subquery. Consider the following example. It's a composite model containing multiple DirectQuery sources. The Driver Activity Agg2 Import table is at a high granularity because the group-by attributes are few and low cardinality. The number of rows could be as low as thousands, so it can easily fit into an in-memory cache. These attributes happen to be used by a high-profile executive dashboard, so queries referring to them should be as fast as possible. 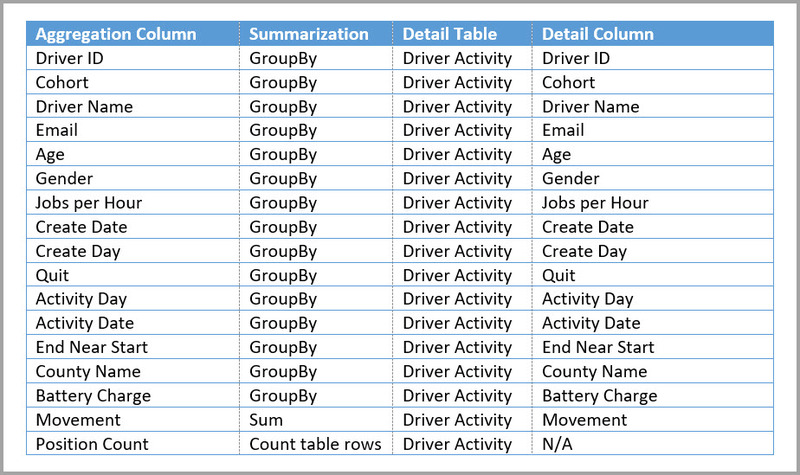 The Driver Activity Agg table is an intermediate aggregation table in DirectQuery mode. It contains over a billion rows and is optimized at the source using columnstore indexes. The Driver Activity table is DirectQuery and contains over a trillion rows of IoT data sourced from a big-data system. It serves drillthrough queries to view individual IoT readings in controlled filter contexts. The memory footprint of this model is relatively small, but it unlocks a huge dataset. It represents a balanced architecture because it spreads the query load across components of the architecture utilizing them based on their strengths. 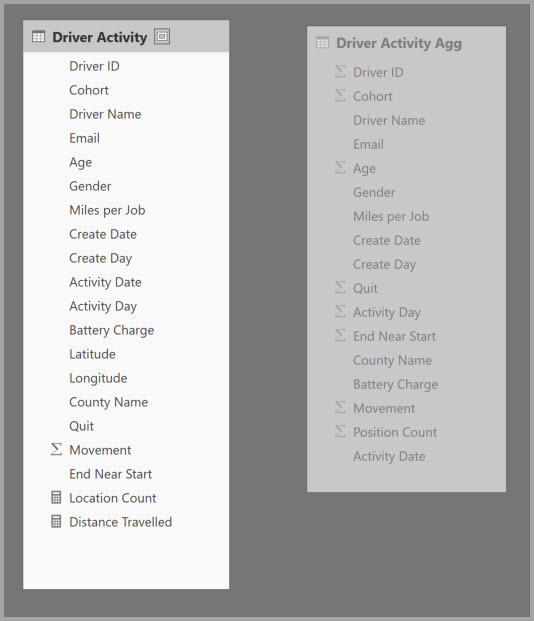 The Manage aggregations dialog for Driver Activity Agg2 shows the Precedence field is 10, which is higher than that of Driver Activity Agg, which means it will be considered first by queries using aggregations. Subqueries that are not at the granularity that can be answered by Driver Activity Agg2 will consider Driver Activity Agg instead. Detail queries that cannot be answered by either aggregation table will be directed to Driver Activity. The table specified in the Detail Table column is Driver Activity, not Driver Activity Agg because chained aggregations are not allowed (see validations earlier in this article). The following table shows the aggregations for the Driver Activity Agg2 table. You can even combine the two techniques for aggregations described earlier in this article. Aggregations based on relationships may require the denormalized dimension tables be split into multiple tables. If this is costly or impractical for certain dimension tables, the necessary attributes can be replicated in the aggregation table for certain dimension(s) and relationships used for others. The following model replicates Month, Quarter, Semester, and Year in the Sales Agg table. There is no relationship between Sales Agg and the Date table. There are relationships to Customer and Product Subcategory. The storage mode of Sales Agg is Import. The following table shows the entries set in the Manage aggregations dialog for the Sales Agg table. The GroupBy entries where Date is the detail table are mandatory to hit aggregations for queries that group by the Date attributes. As in the previous example, the GroupBy entries for CustomerKey and ProductSubcategoryKey do not affect aggregation hits because of the presence of relationships (again with the exception of DISTINCTCOUNT). Note: This model requires that the Date table be in DirectQuery mode to fill in the manage aggregations dialog, because it is a detail table. This is a Preview limitation that we intend to remove for General Availability. 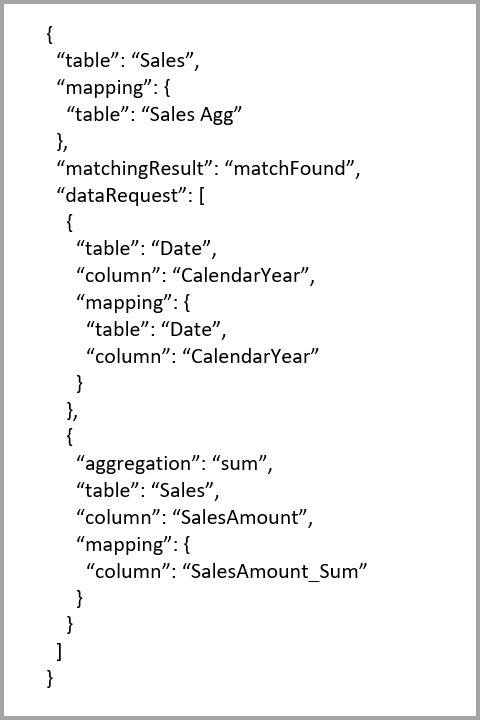 The following query hits the aggregation because CalendarMonth is covered by the aggregation table, and CategoryName is accessible via one-to-many relationships. The Sum aggregation for SalesAmount is used. The following query doesn't hit the aggregation because CalendarDay is not covered by the aggregation table. The following time-intelligence query will not hit the aggregation because the DATESYTD function generates a table of CalendarDay values, which is not covered by the aggregation table. Aggregations that combine DirectQuery and Import and/or Dual storage mode may return different data if the in-memory cache is not kept in sync with the source data. Query execution won't attempt to mask data issues by, for example, filtering DirectQuery results to match cached values. These features are performance optimizations and should be used only in ways that do not compromise your ability to meet business requirements. It's your responsibility to know your data flows, so please design accordingly. There are established techniques to handle such issues at the source, if necessary. The following articles describe more about composite models, and also describe DirectQuery in detail.